White space may be the best solution for additional spectrum, but using it isn’t so simple. From time to time the term “white space” may have popped up in wireless spectrum discussions. Generally, white space describes parts of the licensed radio spectrum that are unassigned, unused, only used part time by the licensees, or not used by them in certain geographic locations. Virtually every country in the world has some of this. Most of this exists in the television spectrum, and is called TV white space. There is now some movement on a global scale to examine this practice and consider giving access by unlicensed technologies, such as super Wi-Fi. This is all part of the general mood of regulators everywhere (including the FCC in the United States) to develop more efficient and effective use of the radio spectrum. It is no longer an option. The impending data tsunami and the burgeoning demand for bandwidth mandates that spectrum everywhere be analyzed and allocated for optimal utilization if we are going to make the data everywhere vision a reality. There is an inescapable truth about spectrum. It is getting scarce. The shortage dates back to 1985, when the FCC opened several bands of wireless spectrum for use by anyone without requiring a license. Prior that, other than ham-radio channels, there was very little unlicensed spectrum. Right now there is quite a bit of hand-wringing going on about spectrum resources in many of the more popular bands. This is one reason there is so much research and activity going on at frequencies starting around 24 GHz, and going up to about 120 GHz. But these higher frequencies present some issues for much of the present technology. This new, unlicensed spectrum (900 MHz, 2.4 GHz and 5.8 GHz), came from the industrial, scientific, and medical (ISM) bands, and was basically opened up to help encourage the development of new wireless communications technologies. These new bands were referred to for years as the “garbage” bands, where non-communications devices such as microwaves lived. White space involves the VHF and UHF TV channel frequencies (about 470 to 890 MHz), although the present discussion is UHF and the focus of this article. There has been a lot of controversy around this since the 2009 mandate to switch to digital television. It was a somewhat painful move, but since then things have settled down. No one wants to give up hard-won licensed spectrum, so there has be a lot of posturing, and this is not likely to abate. Nonetheless, the move to place mobile data on some of these frequencies continues to gain momentum. Why these frequencies? The answer is simple – propagation. VHF and UHF propagation properties are much better than those above 1 GHz. This isn’t just marginal, either. They offer benefits over long distances and through barriers, providing better rural and deep indoor coverage, with potential in heavily congested or dense-path-obstruction applications. There are other formulas that take into account other variables (like the Friis equation, see reference 1), but the purpose of this is simply to compare the two frequencies on an empirical basis. The variable R = range; f = frequency, and c, the speed of light. As an example, let’s compare UHF channel 65 to Wi-Fi’s 2.4 GHZ for at a distance of 1 km. The frequency for UHF channel 65, which is centered around 780 MHz. At a distance of 1 km, the path loss is ~90 dB. For 2.4 GHz, the path loss will be ~100 dB. It doesn’t matter what the original power level was. The relationship remains linear at all power levels. At first glance that may not seem like much, but consider that for every 3 dB of increase or decrease, the signal level doubles or halves, respectively. So a 100 dB signal is three orders of magnitude stronger than the 90 dB signal. Basically, at the receiving end if the 2.4 GHz signal is one milliwatt, the 700 MHz signal will be three orders of magnitude higher, or 100 milliwatts. Of course this is not particularly realistic for typical Wi-Fi or other unlicensed, small cell platforms (although there is some discussion around that for certain applications), mostly due to the distance in this example. But with platforms like Wi-Fi roaming, rural Wi-Fi cells and super Wi-Fi, the industry is seriously looking at the V/UHF bands for extended propagation profiles. And, the pièce de resistance of V/UHF is that it is much better at penetrating obstacles and can travel long distances, over hills, and act much more as a ground wave than 2.4 GHz. This is a real benefit for applications such as rural radio nets, sparsely populated areas, large city centers and highly RF-resistant installations. Super Wi-Fi is, perhaps, the leader in the next generation of unlicensed wireless technologies. The perfect platform is a wireless technology that can scale to any application, on any platform with any technology, but that isn’t like to happen in the foreseeable future. So what happens is various flavors of current technologies are evolving. On the Wi-Fi scene that is, presently, WiGig and Super Wi-Fi. The term is a bit misleading, however. It is not under the Wi-Fi alliance’s wing. In fact, it is more likely to come under a different standards body, such as the IEEE 802.22. The 802.22 standard was announced back in 2004 and came to fruition in 2011. It is the envelope for much longer distances of unlicensed wireless – up to 100 km, but at a much slower data rate (~22 Mbps). And it will be located in the TV white space. There have been updates to it and presently it is up to 802.22.3. The 802.22 is a fixed PMP wireless air interface where a BS is responsible for managing its own cell, as well as any associated CPEs (see Figure 1). The BS controls all medium access within the cell. The basic 802.22 specifies spectral efficiencies in the range of 0.5-bit/sec/Hz, up to 5-bit/sec/Hz. Based on an average of 3 bits/sec/Hz, the total PHY data rate would be 18 Mbps for a 6 MHz TV channel. Assuming a minimum of 12 simultaneous users, that works out to minimum required peak throughput rate, at the edge of coverage, of approximately 1.5 Mbps per CPE downstream. Upstream would have the standard DLS rate pf 384 kbps. 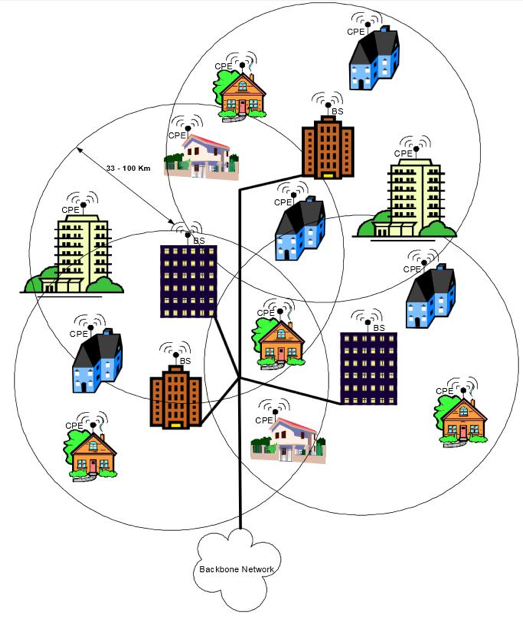 Such 802.22-based networks are called wireless radio access networks (WRANs). They are networks that use the what is often referred to as the “poltergeist” space between VHF and UHF channels and some of the vacant space in this section of the spectrum, as well. To do that, the radios must be smart enough to interleave with bands that have “off” periods, which is when they utilize these bands. There is a very large gotcha here. Because these are unlicensed networks that exist alongside of incumbent licensees and other WRANs, self-awareness among WRANs is critical and must be assured. They cannot interfere with licensed users. WRAN networks are targeted at a variety of areas, include multi-dwelling/multi-tenant units, SOHO, single-family residential, small businesses, and public/private campuses. There is also some discussion for 802.22 systems to be usable in urban and suburban environments, and in remote locations such as wilderness areas. Figure 1 is a graphic of what a WRAN might look like. What makes this work are cognitive radios (CRs) and efficient spectrum utilization. They are “intelligent” radios that adapt radio operating characteristics to real-time environment conditions. This means that they are extremely spectrum-efficient. They utilize unused spectrum in an intelligent way. They can operate alongside other spectrum-licensed radios, in stealth mode, so to speak. CRs monitor the spectrum for bands that are not always in operation, but do not interfere with incumbent devices already licensed for specific uses. CRs are software-defined radios that are frequency agile, use power control, and are self-aware. They are characterized by their utilization of disruptive techniques such as wide-band spectrum sensing, real-time spectrum allocation and acquisition, and real-time measurement dissemination. The PHY layer is designed to handle random behavior. Because both the CPE and the BS function in a random fashion (the BS responds to the random behavior of the CPE). 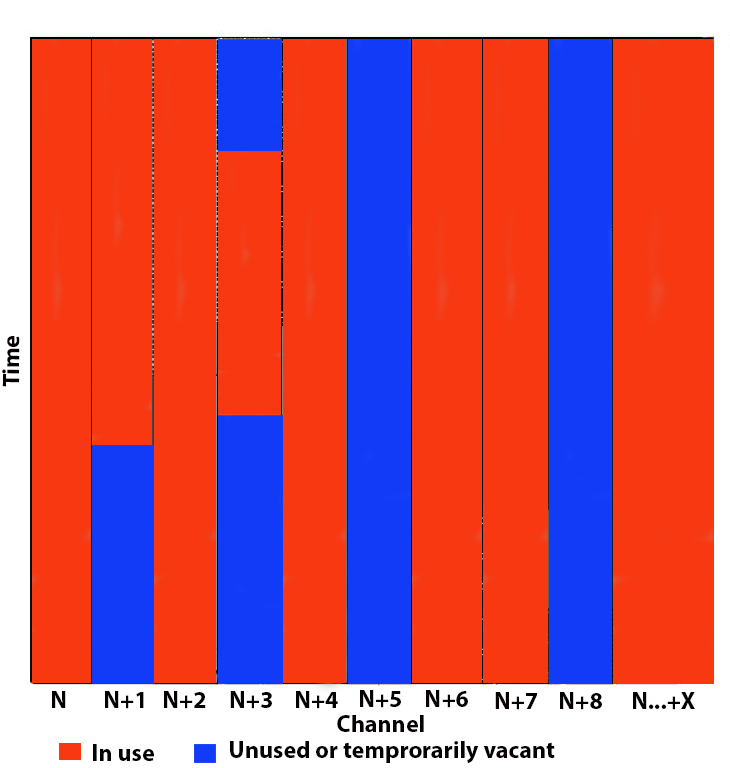 Figure 2 is an example of channel utilization. The utilization generally varies, and, therefore, is random. For smooth transition, the modulation scheme must kept be simple, yet robust. Depending on the multiplexing scheme chosen, there is always a tradeoff between performance and cost. A prime consideration is the number of carriers because that has a significant impact on performance as well as cost. In OFDM-based systems, for example research suggests that in order to order to obtain a flat fading channel—one with no impact on the capture and release of the channel by the WRAN—there would have to be more than 2,000 subcarriers per TV channel. This particular example is ideal for densification because of its enhanced performance, and it’s excellent for highly dense urban areas, but it’s likely to be too expensive and overkill for rural and remote areas. This is the kind of metric that must be evaluated in the design of the PHY layer. Other elements that are in the same pool are power control—802.22 specifies the TPC dynamic range to be at least 30 dB with 1 dB steps, with flexible coding and frequency agility, which is the ability to hop from frequency to frequency as necessary. Figure 2. Channel utilization chart. The other layer, the MAC, is the second element that needs particular attention. The MAC has a requirement to be highly dynamic so it can quickly respond to operating environment variables. It also must be robust in data delivery and provide standard MAC services. Plus, in 802.22, it has a much bigger role. • Initialization – Unlike standard MAC initialization procedures, in this case, because the device is operating in a shared environment on an opportunistic basis, initialization requires some additional steps. It must first be designed to scan the channels to see which are available and build an occupancy map. This information is used by both the customer premise equipment and the base station for transmissions. Because in this case the channels are dynamic, versus a single fixed channel in typical cases, this process must consider variables such as frequency, time, code, or combination of them. • Spectrum management – In unlicensed bands, base stations are tasked with managing measurement activities across the customer premise equipment. This can be either in-band (the channel used by the base station), or out-of-band (adjacent channels). To ascertain the presence of incumbents, MAC design must be able to include the ability to detect signals at very low signal-to-noise ratio levels. And, the detection of TV signals must be done in a non-coherent manner (without synchronization). This is only one unique requirement of the MAC design. Overall, the design must be focused on efficient spectrum management, and incumbent protection. This is done with processes such as channel switching, suspend/resume operations and add/remove channels, which are unique to this application. There are other considerations, such as propagation delay. Once the delay gets past 300 ms, it becomes noticeable. With WRAN distances up to 100 km, customer premise equipment (CPE) can be a long way from the base station, so the base station has to juggle however many CPEs there are at a variety of distances to make sure it stays within that specification. In addition, there can be a large number of interferes affecting propagation (buildings, terrain). Add the dynamic nature of frequency agility, and variable loads, and propagation management becomes a major design consideration. Overall, WRANs have a different design metric. Coexistence with other platforms is always difficult to accomplish. The main culprit is being subservient to the incumbents, which becomes the main design criterion. And it usually is more expensive, as well. Super Wi-Fi in the white space is an interesting concept. While it may not be super-fast, it certainly is capable of going super-far. Exactly where and how that will find homes is still a bit uncertain. Not all devices need the bandwidth, but 22 Mbps is way too slow for many of today’s media requirements. However, this is just starting to emerge. Remember, Wi-Fi started out at 2 Mbps. Today we are looking at gigabit speeds. WRANs certainly will improve performance as the technology matures. So far, it is still in the development stages so until wide spread deployments occur, and a return on investment can be realized, progress will be slow. However, the potential of WRANs is really staggering. 100 km unlicensed nets could appeal to a wide platform of applications, especially in the IoE. It will be interesting to revisit this in a few years.